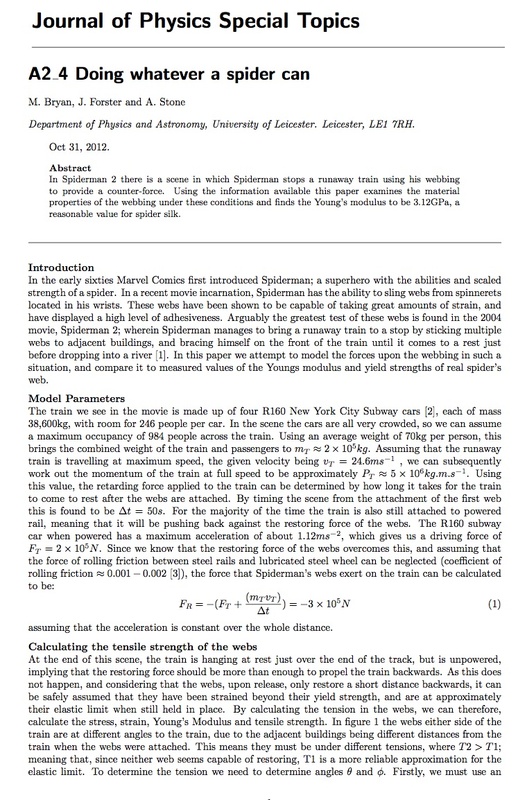 In which it is calculated that a spider’s web is actually strong enough to stop a train. 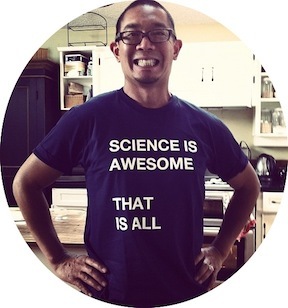 This, from the Journal of Physics Special Topics. In Spiderman 2 there is a scene in which Spiderman stops a runaway train using his webbing to provide a counter-force. Using the information available this paper examines the material properties of the webbing under these conditions and finds the Young’s modulus to be 3.12GPa, a reasonable value for spider silk. In the early sixties Marvel Comics first introduced Spiderman; a superhero with the abilities and scaled strength of a spider. In a recent movie incarnation, Spiderman has the ability to sling webs from spinnerets located in his wrists. These webs have been shown to be capable of taking great amounts of strain, and have displayed a high level of adhesiveness. Arguably the greatest test of these webs is found in the 2004 movie, Spiderman 2; wherein Spiderman manages to bring a runaway train to a stop by sticking multiple webs to adjacent buildings, and bracing himself on the front of the train until it comes to a rest just before dropping into a river . In this paper we attempt to model the forces upon the webbing in such a situation, and compare it to measured values of the Youngs modulus and yield strengths of real spider’s web.